OBJECTIVE: It is well established by Level 1 data that mesh reinforcement of the crural closure for hiatal hernia repair decreases the risk of recurrence of the hernia. Most of the early studies used various synthetic meshes for repair of hiatal hernia and while they showed decreased recurrence rates, the fear of erosion of the prosthetic into the esophagus kept use of mesh for hiatal hernia repair from becoming standard of care. With the recent development of various biologic materials for hernia repair many surgeons applied these products to hiatal hernia repair and this led to the most recent randomized prospective trial showing a biologic mesh significantly decreased the recurrence rate in hiatal hernia repair. Some of the problems of biologic meshes are the high cost, the difficulty in handling these prosthetics and the difficulty in fixation of many of them. In addition, a recent study by Fillipi found several cases of esophageal erosion from the use of a biologic mesh. For these reasons we evaluated a new prosthetic for crural reinforcement during hiatal hernia repair. METHODS: From February 2009 until September 2009 fourteen patients underwent hiatal hernia repair using a synthetic bioabsorbable prosthetic made of polglycolide and teimethylene carbonate (Gore BioA Tissue Reinforcement?). This material is a non-permanent scaffold for tissue regeneration made of bioabsorbable polymers. There were 8 patients with paraesophageal hiatal hernias and 6 with large sliding hiatal hernias. The prosthetic comes from the manufacturer as a “u” shaped piece such that the material can “cradle” the esophagus. We believe that this shape can lead to contact with the esophagus and thus in this study a square piece of the mesh just the size to cover the crural closure only was utilized. Fibrin glue was sprayed over the suture closure of the crura, the mesh was placed over the glue and held in place for several seconds and then more fibrin glue was sprayed on top of the mesh. Once the fundoplication was performed there was no contact or exposure of the mesh with the esophagus. 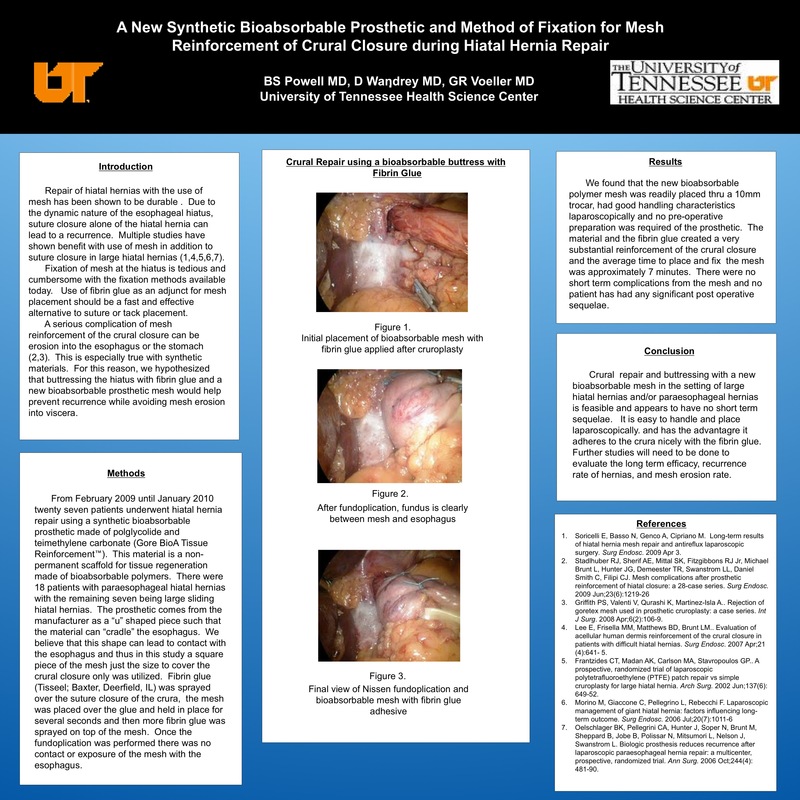 RESULTS: We found that the new bioabsorbable polymer mesh was readily placed thru a 10mm trocar, had good handling characteristics laparoscopically and no preop preparation was required of the prosthetic. The material and the fibrin glue created a very substantial reinforcement of the crural closure and the average time to place and fix the mesh was approximately 7 minutes. There were no short term complications from the mesh and no patient has had any significant postop sequelae. CONCLUSION: Crural closure reinforcement during hiatal hernia repair can be done readily with this new bioabsorbable polymer based mesh. Fibrin glue fixation of this new prosthetic can be done quickly and creates a strong barrier. Further studies will need to be done to evaluate long term efficacy and complications associated with its use.